Ah, September! With the calendar turning to September this coming week, a new pastoral year will begin! It’s hard to believe how quickly the summer months have passed, and now, we settle back into our regular routines. Commercials on TV and radio have bombarded parents with preparing for the return of their child/children to school. The central message is, essentially, preparing for the big “back to school”. It is a time to recommit to a routine that brings growth and enrichment, new understanding and surprising lessons – some of which are learned the hard way. For the past several weeks, the scriptures being read at Mass are doing a similar thing: preparing us for the eternal kingdom. The preparations are revealed through the Parables, their mission, to have everyone experience the kingdom of God – the greatest treasure we can acquire. As we get back to our busy lives, we should take time to reflect on who God is calling us to be and what God wants us to do. How wonderful it will be to share our sense of God’s presence and direction as we gather as a Parish community at our Fall Picnic on September 21st , and then as we stand up for Life during the upcoming 40 Days for Life (Sept 24 – Nov 2) and at the Life Chain on October 5th. Fellowship opportunities are back on the agenda. When we know one another and know the joys and concerns we are each experiencing, we can pray for, support and minister to one another. Did you know there are 56,000 members of the Knights of Columbus in Ontario alone? The fraternal order is prominent in parishes throughout the Archdiocese of Toronto, serving the needs of our communities through the principles of “Charity, Unity, Fraternity and Patriotism”. Their contributions were celebrated August 5-7 at a global gathering in Orlando, Florida. 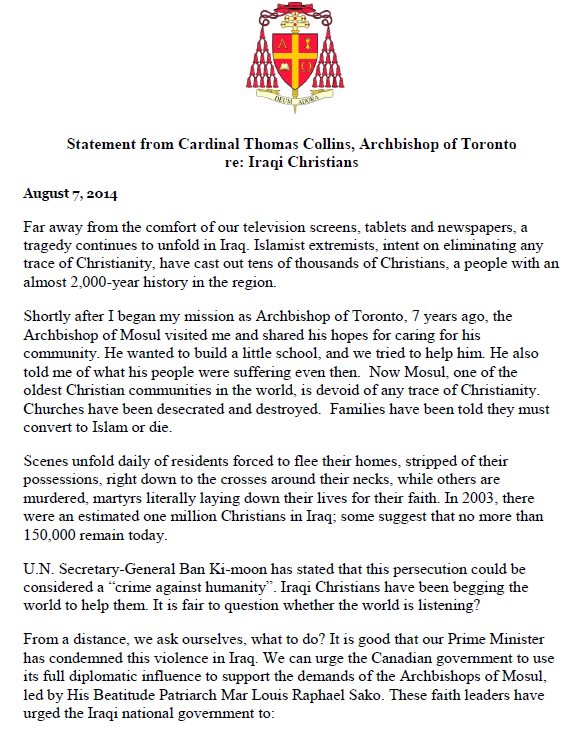 The Knights of Columbus provide the following report. 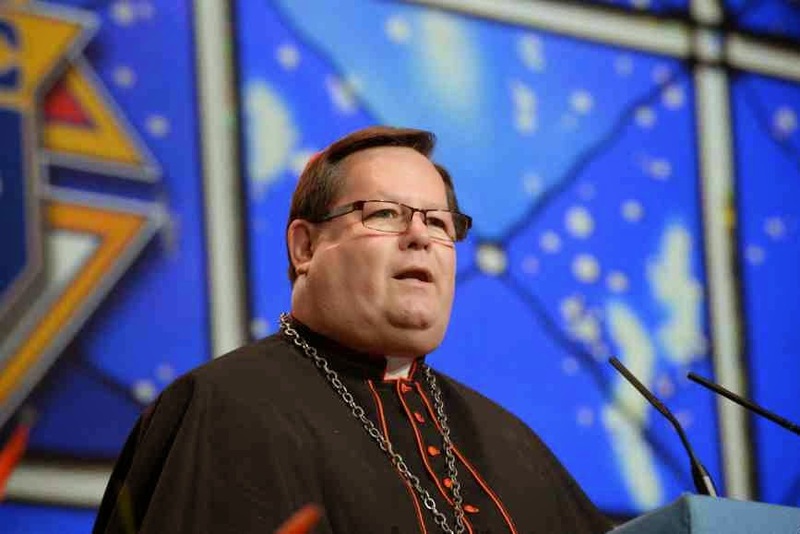 The Knights of Columbus’ 132nd annual international convention honoured a number of Canadian Knights and councils and featured a keynote address by Canada’s Cardinal Gérald Lacroix, ISPX, archbishop of Québec and primate of Canada. Cardinal Lacroix gave the keynote address at the event’s opening dinner. He was joined at the convention by nine other Canadian archbishops and bishops, including Archbishop Paul-André Durocher of Gatineau, president of the Canadian Conference of Catholic Bishops. Globally, Knights donated more than $184 million and 70.5 million hours of service to charitable causes in 2013. The Canadian contribution was an all-time high of more than $30 million and 9,323,063 hours of service. Of the Knights’ 70-plus regions, known as states, Québec placed first in the world in charitable donations for the fifth consecutive year, giving $11.4 million and nearly 1.7 million hours of service to charitable causes in 2013. Ontario came in second with $7.9 million. When it comes to the amount of time volunteered per member last year, four Canadian jurisdictions were in the top 10. Prince Edward Island took first place with more than 135 hours per member. British Columbia was second with nearly 114 hours, while Saskatchewan and Nova Scotia rounded out the Canadian presence in the top 10. Founded in 1882 by Father Michael J. McGivney, who completed some of his priestly studies in Montreal, the Knights of Columbus has grown to more than 1.8 million members. The first Canadian council was established in Montreal in 1897 – just 15 years after the founding. “This has been a special year for Canada,” said Anderson. He reported to the convention that the Knights’ Supreme Council, the Knights’ Québec State Council and the Canadian Association joined together to fund a new holy door – used only when the Church proclaims a holy year -- at the Basilica of Notre-Dame de Québec. The first Vatican-sanctioned holy door in North America, the massive bronze door bears the emblem of the Knights of Columbus. The Knights also joined with the Church in Québec in celebrating the 350th anniversary of the Church in Québec, the canonizations of St. François de Laval and St. Marie of the Incarnation, and the Knights’ supreme directors made a special pilgrimage to pray at the tomb of St. Brother André in Montreal. Many of the proceedings were broadcast on Salt + Light Television and can be found on social media with hashtag #KofCFL14 on Twitter, Facebook and Google+. More information is also available at www.kofc.org. The Holy Father is following with deep concern the dramatic news reports coming from northern Iraq, which involve defenceless populations. Christian communities are particularly affected: a people fleeing from their villages because of the violence that rages in these days, wreaking havoc on the entire region. The Pope also appeals to the conscience of all people, and to each and every believer he repeats: “May the God of peace create in all an authentic desire for dialogue and reconciliation. Violence is not conquered with violence. Violence is conquered with peace! Let us pray in silence, asking for peace; everyone, in silence.... Mary Queen of peace, pray for us! (Angelus, July 20, 2014)”.